There has been a striking amount of activity around the work of Francis Quirk in the last few months. We do not know the reason for it, but it certainly is keeping this blog busy. 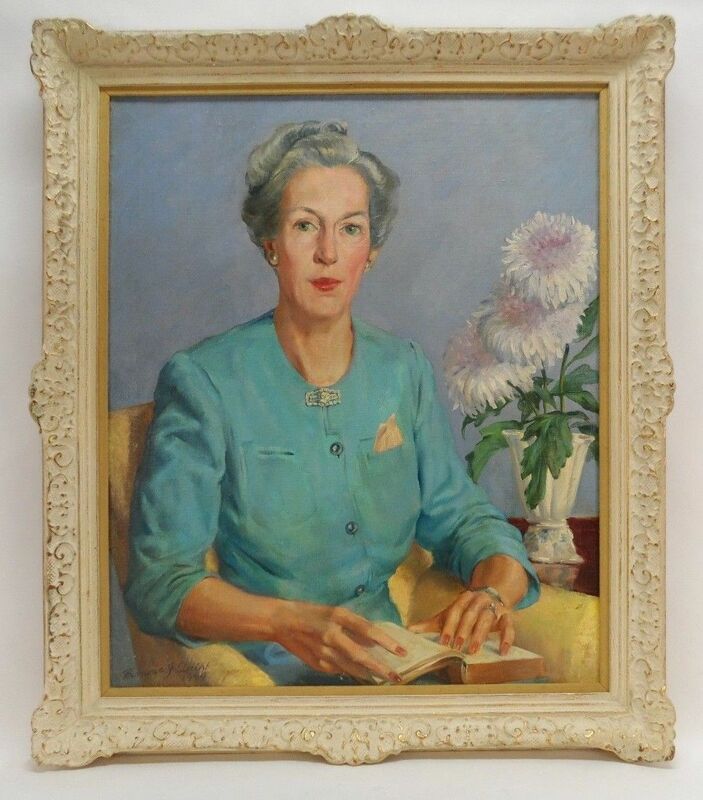 The beautiful portrait below is for sale through EBay from a firm in Chula Vista, California. 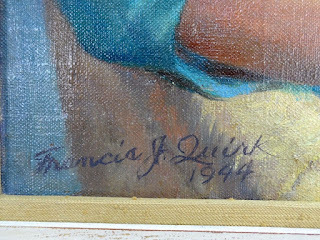 The oil on canvas measures 30"x25" and is signed Francis J. Quirk in a script signature and dated 1944. He would have been 37 at the time it was painted. 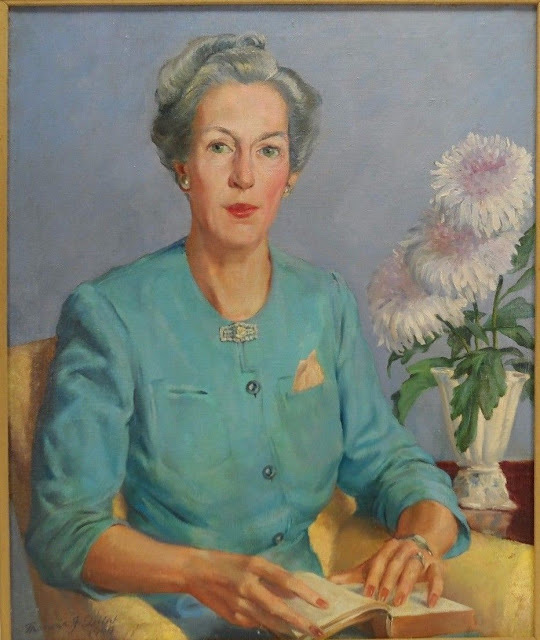 The woman is impeccably groomed in an aqua dress, sitting in a yellow upholstered chair with a vase full of beautiful peonies blooming beside her. This portrait is one of softer tones with the pale blue background and a lavender tint to the peonies. There is nothing jarring or popping at the eye. This woman is no shrinking violet. She is firmly holding our gaze with those bright green eyes. But, let us examine some of the wonderful details that show she is a woman of some means. Look at the jewelry. The pearl earrings are sizable. There is a significant diamond broach at her conservative neckline. Yet, there is even more. 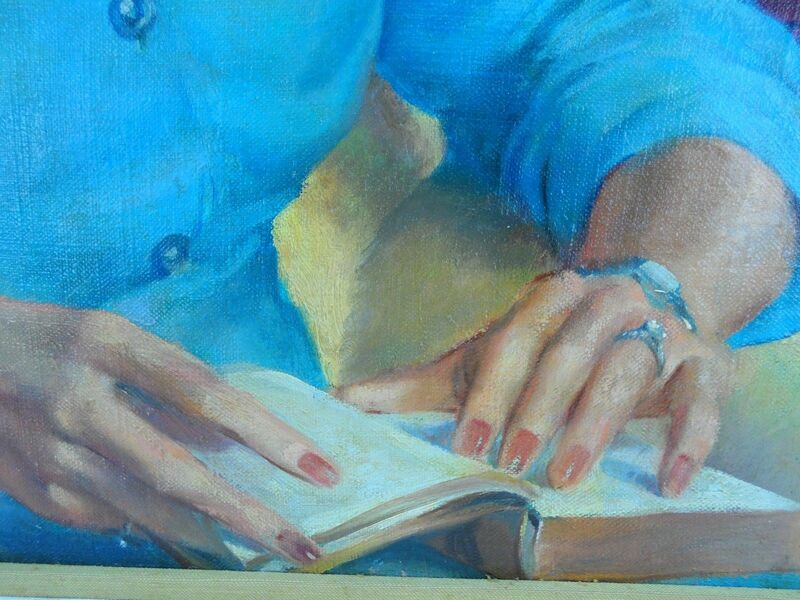 On her left and there is a substantial diamond on her ring finger along with a watch. Hidden in the shadows of the right hand appears to be a significant emerald on the smallest finger. And of course the nails are beautifully manicured. Not only are they painted red, but also they glisten and shine, like the blood in Eakins Gross Clinic. Those nails also match the lipstick perfectly. The color also tells us something about the woman sitting for the portrait. She chose red. Not pink. Not plain, Not clear. But bright red. Yet there is one more significant detail in the book. If you look closely at the finish of the pages it is in the color gold. This is no cheap paperback she is reading. Nor is it a nice hardcover novel. She is reading a book that was prepared to be seen on a bookshelf in a library; bound and finished so that it denotes quality. 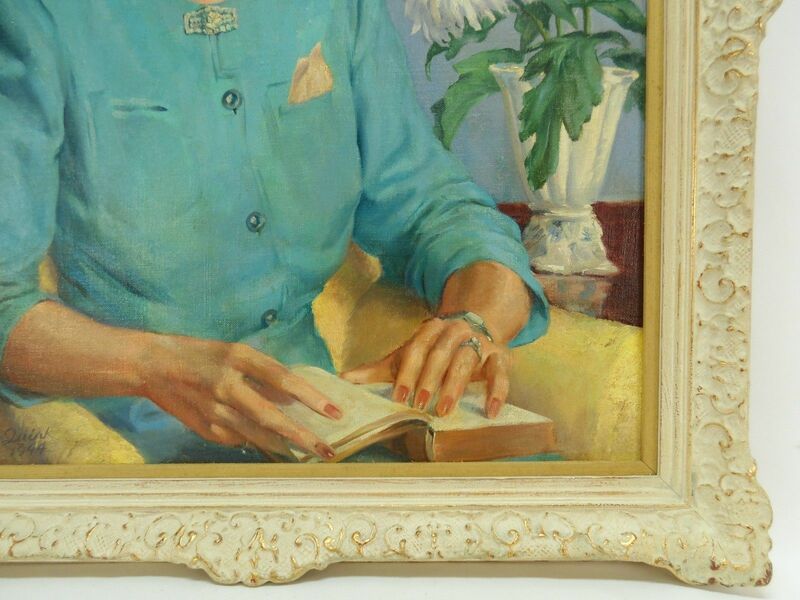 The close up below shows one of the subtle but attractive elements of this painting in the reflection of the vase in the table's wood surface. Even though it is a decorative element, it gets the full attention of the painter. The painting of the leaves is exquisite as well. We end with one more image. 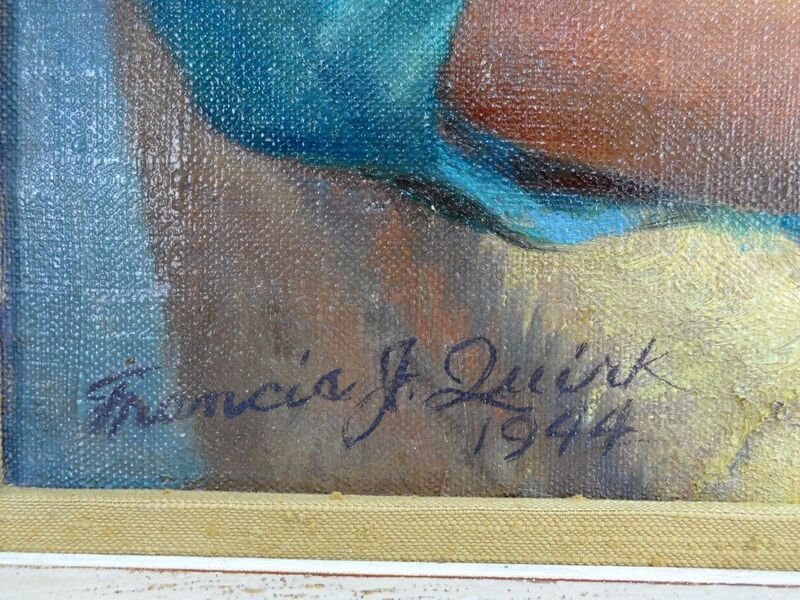 The signature of Francis J. Quirk executed in script with the date 1944. He too is not shy about his signature signing in a bold blue script that blends with the colors of the painting.